Intent: To create a lightweight and conformal variant of the typical deflector shield generator, which can be utilized without radioprotective equipment. Acceptable Radiation Exposure: The energy shield emits a minimal amount of radiation during typical use, which is safe for most human, near-human, and humanoid species. Variable Protection: The energy shield is capable of deflecting plasma, laser, maser, slugthrower, and verpine projectiles/energy bolts. Vulnerable to Melee Weapons: Most modern melee weapons can disrupt the shield protective field in a single strike. Lightsabers, plasma, and mono-edged blades are especially capable of breaking through the energy field, while also maintaining enough force to potentially deliver severe harm to the operator. Limited Protection: The shield is not as robust as most energy shield systems, including the VDS-01 “Aegis” utilized by the Golden Company. It can typically absorb 5-7 medium-powered blaster bolts, 10-12 medium slugthrower shots, or one high-caliber/powered energy/slugthrower/blaster shot from a sniper/anti-materiel rifle platform before disrupting. In essence, the shield is powerful enough to protect its wearer from brief but not concentrated fire. Radioactive Burst: When it is disrupted, the shield emits a burst of radiation which can be harmful in repeated occurrences, especially if the operator is not wearing protection,. Recharge: After being disrupted, the shield will take 15 seconds to restore itself. During this period, it is recommended that the operator take cover in order to minimize the chance of them taking fire while the shield is down. If the shield takes damage, but does not suffer disruption, it will typically take 5 seconds for the shield to recharge back to full power. Sonic Weaponry: The shields are utterly useless in defending against sonic-based attacks. 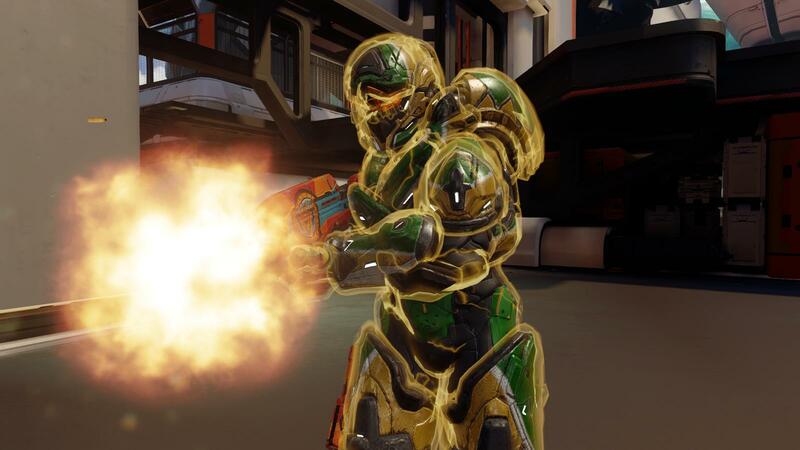 The energy shields present no barrier against sonic waves, and as such, the operator will need to rely on other devices and/or systems to protect against them. Visibility: The shields are invisible when not deflecting attacks. However, whenever they absorb an attack, they tend to glow in a bright gold color. This effect is amplified the more attacks they absorb within a short period of time and the closer they get to becoming disrupted. The CPD-ES03 is a body-conformal triple-phase personal energy shield which combines deflector, ray, and concussion shielding technology to protect the wearer from blaster (laser, plasma, maser), kinetic, and fragmentation weapons. As a standard feature, the shield itself conforms around the user, severely lessening occurrences where the shield “catches” projectiles which would have not harmed the wearer in the first place. In addition, the shield itself is designed to allow acceptably safe utilization by individuals not wearing radioprotective equipment. As such, the shield can also be used by VIPs in need of discreet protection. Intent: To create a staggeringly potent anti-materiel and anti-power armor single-shot weapon for use by unaugmented infantry. High Accuracy, High Precision: The Lance is extremely accurate and precise for a weapon of its size. Stopping Power/Armor Penetration: The Lance is capable of engaging and neutralizing light vehicles, low-flying fighters, and power armor-clad infantry to awesome effect. The hypersonic 15x68mm projectile is capable of penetrating conventionally manufactured armors with a thickness in excess of 50 mm. It is also able to punch through armors manufactured from exotic and heavy materials, provided the armor has less thickness. Shield Breaker: The hypersonic 15x68mm projectile is more than capable of penetrating, disrupting, and/or nullifying infantry-grade personal energy shield systems in a single strike, while also maintaining more than enough force to penetrate (potentially over-penetrate) any armor behind the shields. However, the projectile tends to struggle against more robust vehicle and fighter-grade energy shield systems. Single Shot/Low Rate of Fire: As a single-shot weapon, the Lance demands a consummate amount of precision and accuracy from its operator in order to perform according to expectations on the battlefield. Severe Recoil: Although the Lance features a built-in recoil reduction system, it still has a strong kick-back which can be difficult to control if the operator is unprepared for it. Unwieldy/Heavy: Although the Lance was built to allow optimal firing in a typical upright shooting stance, it is still heavier than more conventional weapons of its class. A physically vigorous operator is recommended for prolonged operation, especially when the weight of a typical field loadout is considered as well. Sensitive System: The Lance is built on a highly sensitive and maintenance intensive platform. Although the components are manufactured from durable material, they are also very delicate and easily subject to damage if the weapon is handled carelessly. The K-22/02 “Lance” is a single-shot anti-armor weapon used by frontline troops in the Stormtrooper Corps, Army, and various special forces of the Core Imperial Confederation. The weapon operates according to the principles of a gauss rifle, possessing a linear motor which accelerates the projectile in the barrel to a forward velocity which is many times the speed of sound. It fires a caseless 15x68 mm projectile with a mass of 64 grams, which imparts an average of 135,578 Joules of force upon impact. As such, the weapon’s penetrative abilities are nigh-unparalleled, even in comparison to other gauss or rail-type weapons. Specifically, the projectile can easily punch through even the most exotic and heavy materials used in armor, including (but not limited to) durasteel, cortosis, phrik, and beskar. The Lance is most effective as a force multiplier when used against low-flying fighters, light vehicles, and walkers, by granting unaugmented infantry the ability to neutralize those targets. Although the platform is indisputably effective at annihilating infantry, its low rate of fire and potential for over-penetration hinder its efficiency against such targets, especially during intense firefights in close-quarters. However, the Lance’s accuracy, precision, and range allow it to be utilized as a makeshift sniping weapon if called for. As a means of controlling recoil, the Lance has built-in charge capacitor which converts the energy from kinetic recoil into power. After the first shot, the power cell requires a much lower percentage of its charge to fire, because of the reserves of energy retained from recoil. The system vents waste heat from the front and sides of the barrel, and as such, the weapon tends to run hot during prolonged firing. However, because of the weapon's low rate of fire, heat is very rarely an issue during standard operation. Tagging, Tobias Wrynn, Tanomas Graf, FN-999, ST-00/0666 (Myself), Tathra Khaeus, Dominic Craig, Aisha Ren, Ashara Evanaris, and Demitry Draskovits. This is the unofficial OOC for the Bespin Brawl thread. I hope to maintain and facilitate an open dialogue among all parties involved in the skirmish, while also keeping OOC antagonism to a minimum. To begin, Aisha Ren I want to clarify a detail in your post. Did you write your character as killing two NPC CIC stormtroopers or did you write her choking ST-00/0666 and Tobias Wrynn in your opening post? If anyone else needs any clarifications made, I encourage you to use this thread to do so. First Intent: To create a bioengineering and cloning technique which represents a logical advancement from the comparatively primitive Kaminoan cloning practices depicted in the prequel movies. Second Intent: To improve the playability of biosynthetic/"clone" characters by allowing players significantly more freedom to customize biosynthetically created characters without being locked into a pre-selected appearance or personality template. Engineered Variance Cloning (EVC) can create wholly unique subjects from human, near-human, and humanoid species. The benefits of EVC over traditional cloning methods include diversity, better ability to assimilate into society, and markedly longer lifespans. Diversity: Because each individual produced via EVC is genetically and phenotypically unique, the clones are more easily assimilated into groups of naturally born individuals. They are not immediately recognizable as artificially produced lifeforms because they lack the uniform appearances ubiquitous to clones produced from more outdated processes. Genetically Perfect/Engineered: EVC clones are genetically engineered and optimized. As such, they are almost always free from disorders, malignant conditions, and harmful mutations. Any clone that is produced with a genetic disorder is humanely euthanized before their body is sent to the internal labs for research purposes. Unpredictable: Although the diversity of the clones is beneficial to their integration into groups of naturally born individuals, their inherent individuality can make them somewhat unpredictable, especially when working in operations which demand and end enforce strict uniformity. These issues can be alleviated by engineering to encourage the development of conformist traits over maverick ones. However, genetic engineering aimed at adjusting personality traits of subjects is by no means a perfected science. As such, individuals frequently deviate from their established “programming” in spite of all efforts to eliminate unwanted tendencies. Uncanny: While the genetic perfection of the clones is mostly beneficial to their quality of life, they frequently possess subtle phenotypic features which distinguish them from naturally born members of their species. For example, biosynthetic human (and near-human) clones tend to have perfectly symmetrical facial features. They may also possess skin, eye, and hair colors which fall outside of the spectrum of naturally occurring colors. As a result, many clones can be roughly distinguished from naturally born individuals because of the striking perfection and symmetry of their features. Engineered Variance Cloning (EVC) represents a natural improvement in cloning practice which takes full advantage of breakthroughs in biotechnology, biochemistry, and bioengineering made since the end of the Clone Wars. In essence, EVC is a cloning process which utilizes the DNA of multiple template organisms to create a genetically unique and engineered individual. Rather than utilizing the DNA of a single host to create a baseline copy of the original source, EVC requires the DNA of multiple hosts to create a fundamentally unique individual which is then bioengineered to remove any defects, disorders, or unfavorable conditions. EVC allows for the mass production of genetically and phenotypically distinct individuals, thereby facilitating the integration of the biosynthesized subjects into an environment of naturally born individuals. Ironically, the subjects produced by EVC are not clones by definition, but rather, biosynthetic lifeforms. Unlike clones, they tend to lack unifying traits and tendencies. As a result, they are typically less predictable than traditional clones, unless their genetic codes are selectively engineered to encourage the development of certain traits over others. The number of template individuals which contribute to a certain gene pool for a cloning batch can number in the hundreds or thousands depending upon the size of the batch and the needs of the client. Each host individual is intensely screened for genetic disorders, harmful mutations, and deleterious abnormalities in order to alleviate the amount of engineering needed to clear the produced subjects of unfavorable conditions. The hosts are also screened for DNA from different species in order to prevent the intrusion of foreign genetics into the pool. At its current stage, EVC is unable to produce healthy hybrid individuals, and as such, the production of these subjects is only done internally for research purposes. The entire production process of a single clone typically takes as long as twelve hours. In the first step, the body of the clone is created via chemosynthesis. At the time of creation, the body is physically and neurologically mature to the equivalent of roughly eighteen years of age. After the body is created, it is then merged with an artificially synthesized consciousness, at which point the clone is considered to be fully alive. After this, memory imprints are scanned into the brain of the new clone. These memories typically include basic socialization, and language skills, along with basic combat training for clones intended for military application. Once the memory imprinting phase is complete, the clone is released from the growth tank and escorted to the medical laboratories to complete a full physical before being delivered to the client. Human subjects can typically expect to have lifespans in excess of 90 years. Their bodies do not show signs of age past young adulthood (roughly equivalent to 20-23 years of age) until they turn approximately twenty years old, at which point their bodies will begin to age at a normal rate. Subjects from longer-lived species can expect to have lifespans and aging cycles which are similar to that of naturally born individuals from their species, albeit slightly longer. For example, Elzeri subjects have estimated life expectancies of a little less than six centuries, while also not showing signs of aging until their final few years. I am looking for writing partners for a few non-canon practice PvP matches. PvP is one of the things that gets my creative juices and excitement flowing the most, and naturally, I want to get good at it (and fast!). I'm looking to write with people who have a lot of experience in writing PvP, but even if you don't, I am more than willing to practice and learn with (and against ) you! I plan for the threads to be non-canon and to primarily take place within an arena-like setting, with killing as a winning condition. Since these threads are non-canon one-offs, any character that dies will still be able to be played in canon and non-canon RPs. As such, I would like for the focus of the threads to be on learning and friendly competition. Finally, I would like to engage primarily in one-on-one duels, but if anyone wants to do a team deathmatch or battle royale type matches, I am open to those types of fights as well. Anyways, thank you for reading this and if you're interested please let me know as soon as possible. P.S. Forgot to add this in, but if you're looking for an idea on what to expect, I have already started a few threads with people for these types of duels. I've linked one of them below.